I was searching my bookshelves for something to read on holiday and I found an old, paperback copy of Hardy’s Tess of the D’Urbervilles – I have no idea where it came from. I remember reading Far from the Madding Crowd in high school, and I thought it was time to get in touch with Hardy again. 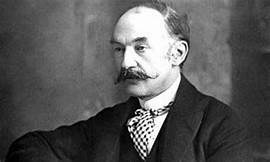 Thomas Hardy was born in 1840 in a rural community in Dorset, England to a working-class family which did not have the means to send him to university. He trained as an architect in Dorchester, and moved to London to pursue a career, but he was never comfortable in London, where he was acutely conscious of his class and social inferiority. Returning to Dorset in 1867, he began his first novel, The Poor Man and the Lady, which was rejected for publication; he subsequently destroyed the manuscript, but subsequently wrote three novels: two published anonymously and one, A Pair of Blue Eyes, in his own name. This latter novel concerns his courtship of Emma Gifford, who became his wife and encouraged him to write full time. In 1874, Far from the Madding Crowd was published and was followed be ten novels, which attracted an increasingly hostile reception for ‘pessimism’ and ‘immorality’. In fact, Jude the Obscure, Hardy’s last novel (1895), was burned by the Bishop or Wakefield. In his memoir, Hardy said: “After these [hostile] verdicts from the press, its next misfortune was to be burnt by a bishop – probably in his despair at not being able to burn me.” Hardy then turned his attention to writing poetry and short stories until hes death in 1928. Tess was also criticised for its immorality and its implied criticism of social and religious culture, which, viewed from a 21st century perspective, is difficult to understand. Hardy’s themes include the examination of social themes in Victorian England: marriage, education and religion, that limited people’s lives and caused unhappiness. Hardy’s religious beliefs seem to have been a combination of agnosticism and spiritualism; he rejected the religious doctrine of his time. For him, education was an unfair badge of social status, and the sexual mores of Victorian England were often a millstone around people’s necks. Tess, the lead character in Tess of the D’Urbervilles, is a beautiful farm girl whose lower class status is denied by her father who fancies that his family are descendants of the old, aristocratic, D’Urberville family. She is sent to work for an old, matriarch and her ne’er-do-well son, Alec, of the D’Urberville family. She dislikes the son for his arrogance and his bothersome attentions, but she is taken advantage of by him and becomes pregnant. How this happens is left to the reader’s imagination. Her baby dies and she goes to work on a distant farm where she meets a middle class man, Angel Clare, with whom she falls in love. When he asks her to marry him she is distraught, as his expectation must be that she is a virgin. Finally, she accepts Angel’s proposal and commits to revealing her sin to him, which she does on their wedding night. He, a man of strict morals, rejects her and emigrates to Brazil. She is heartbroken, and goes to work on a hard-scrabble farm, where, once again, she meets Alec. Separated by thousands of miles, Tess and Angel pine for one another, and he comes back to England to find her. But, owing to dire financial circumstances, she has been taken by Alec as his mistress. Angel follows her trail and finds her with Alec in a smart hotel. The story ends tragically. The first two thirds of the novel is beautifully written at a leisurely, captivating pace. Hardy’s love of Tess, the English countryside and its culture shines through. At the same time there is a sense of impending disaster which pulls the reader along. It seemed to me that the last third of the novel was written in a hurry by an author who wanted to get to the conclusion. Character development in the first two thirds was measured and complete, but the changes in Alec and Tess toward the end seem somewhat dubious. Alec’s transformation from scoundrel to preacher and back to a scoundrel seems barely plausible – as does Tess’ out of character change in the last few pages to pliant mistress with a hidden fury. Strangely, Hardy has Tess swear an oath on an ancient stone monument, and one is braced for a repercussion, but none appears. Then there is the character Lisa-Lu, Tess’s sister, who comes on stage at the last minute in an important role, without previous introduction. I enjoyed reading Tess, and I also enjoyed finding what I think are errors by a great author.